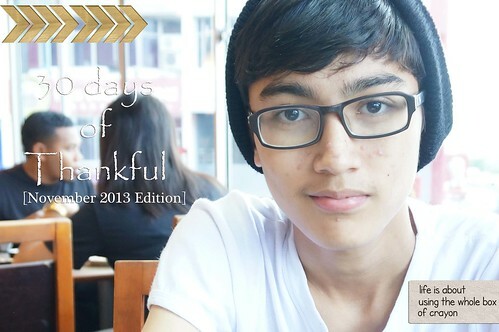 We are on the last Saturday of November and this also mark the end of 30 days of thankful project. So far I just love making a thankful list daily. It's a little reminder to me to take a pause and be thankful for all the great things in my life right now. I am so glad that so far I don’t have any trouble sleeping even though I still have a baby/toddler in the house. I am loving the time we spend together as a family – bowling, watched movie, eating together and many more fun activities. I am so thankful that I have a house which I can call a home. Even though it wasn’t big or fancy but it’s comfortable enough to fit my lifestyle. This is so helpful when you’ve make a mistake and there’s an undo button you can press to get right back to your original file or text. I am so loving my windows filing system which let me cut/copy and paste from one storage to the next with ease. Three of four years ago people used thumb drive to move files from one computer to the next, now we use cloud storage. This technology makes our data/files available to me from any devices. I just can’t imagine my life without it.